I remember being worshiped in the sacred groves of Babylon, between the twin sycamores of Egypt, by the figs of Ancient Rome, among the yews and elms in the Celtic lands. My followers understood what many have now forgotten: soaring branches, trembling leaves, and twisted roots make the purest chapels. Tranquility thrives in the midst of growing things. Walls may offer a temporary refuge, but stone cannot breathe. Mortar soaks up the songs and keeps them for itself. Stained glass imprisons the essence of prayers in its too-bright colors. But trees—trees pass the hopes and heartaches and dreams to one another. And, eventually, those heart-cries make it to me. I breathe them in. I share my bounty. I impart wisdom. Above all, I answer. There is a spritely girl in the western lands who still hears me. Amelia is her name. In the midst of the evergreens behind her home, we speak. Though a young soul, her beauty runs deep. Deeper than any I have come across in hundreds and thousands of days. She searches for me, giggles with me, tells me her secrets. Yesterday, Amelia brought others to her grove. 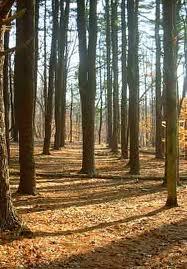 They scratched their feet through the pine straw to make way for the earth to show through in patches. Amelia and her friends formed the straw into long lines to create separate rooms in what they called a house. But the children could see over the walls. They could talk, and breathe, and play, and dream. I sent them a soft breeze. I tickled them with sunlight trickling through the trees. My hope has been dying. I feared, for yes, I fear, that I might pass into the land of things which are no longer loved. Amelia has saved me. After all these suns and moons of waiting and fading, she has remembered me well, when few others would. This morning, I planted honeysuckle all around her grove. The sprouts sprang up and I carefully wove the climbing vines around the trunk of each of Amelia’s pines. I know she will notice. She will ask me about them. And I will tell her the vines are a gift. She will smile. I will show her how to pluck the blossoms, ease the stamen through the bloom to catch the tiny, sparkling drop of nectar, and to place the drop on her tongue. She will savor the sweetness. She will taste them all, every last blossom. And I will grow her more. Amelia has given me much honor. Her willingness to know, to remember the olden things, to seek the sacred hidden among the trees, will be rewarded. Today, once she has tasted the nectar, I will bless her with the full measure of my glory. And I know my new priestess will pass it on. This entry was posted in Contests, Flash Fiction, Short Stories, Writing and tagged Contest, flash fiction, nature, Winner!. Bookmark the permalink. I thought it was very interesting to have written this from the tree’s perspective. Nicely done. Yeah, that was it. When they reactivated my site, I tested it again. Then BAM, my site went down. Apparently WordPress is fickle about links. The moral of the story is: WordPress doesn’t want its users to give credit to the creator of source images??? o.O lol. Silly WordPress. Oh wow. The narrative actually reminded me of Game of Thrones! Very cool idea. Thx, Sam. The timing is right, and it does have some Imbolc qualities to it. If I would have substituted rushes for the pine straw and blackthorn for the honeysuckle, it’d be closer still. It’s not Brighid’s perspective, perse, but definitely one like her. I love the perspective. Your story reminds me of The Giving Tree. I especially liked the line, “But trees—trees pass the hopes and heartaches and dreams to one another.” Great writing! I had the same problem with my WordPress site. They don’t like the website where the picture originated. My blog was deactivated for a bit, too. Thought I was doing the right thing by giving credit. Ha.